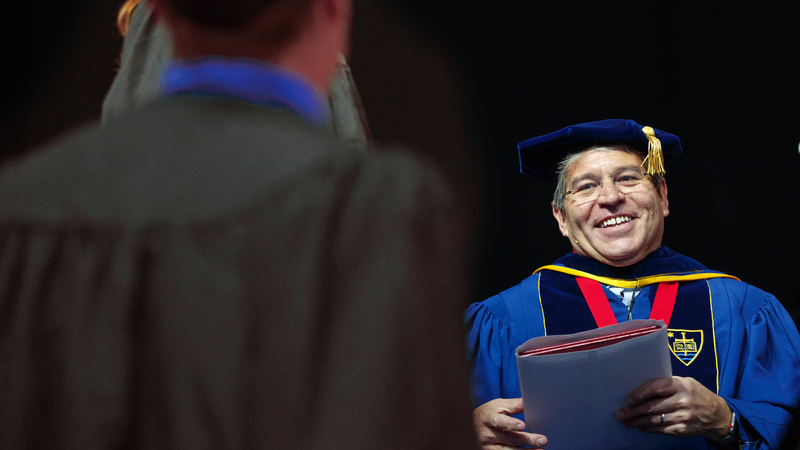 Lance C. Pérez prepares to hand a diploma to a Nebraska Engineering student during the undergraduate commencement ceremony on May 5. Pérez has been named dean of engineering. 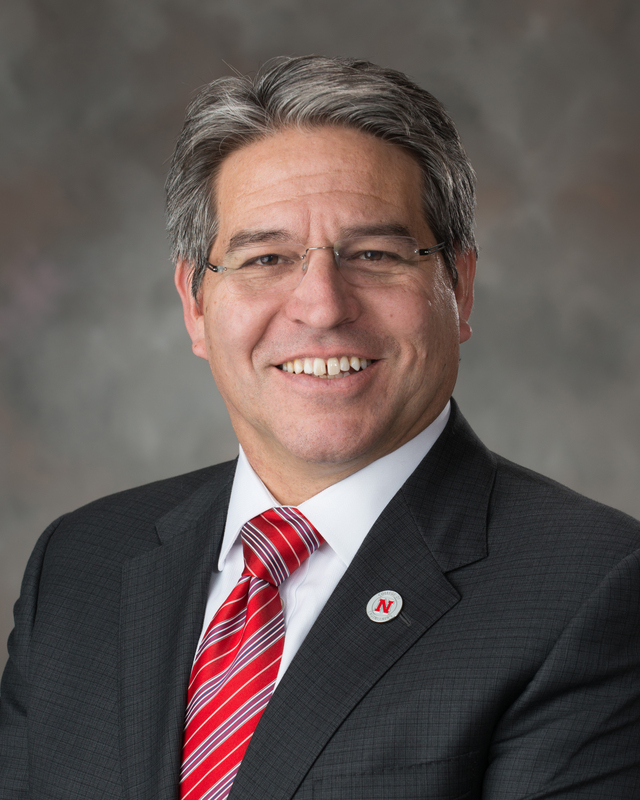 After serving nearly two years in an interim position, Lance C. Pérez has been named dean of the University of Nebraska–Lincoln’s College of Engineering. Donde Plowman, executive vice chancellor and chief academic officer, made the announcement May 10. Pérez will formally begin the appointment, which is pending Board of Regents approval, on May 15. “Lance has done an outstanding job leading Nebraska Engineering in an interim role and is the right choice to help the college build upon its current positive momentum,” Plowman said. “I am confident in Lance’s leadership abilities and I look forward to working with him at this important time for the college. An experienced academic and campus leader, Pérez has worked as interim dean of the College of Engineering since July 2016. He previously served as associate vice chancellor for academic affairs as well as dean of graduate studies. He has been a faculty member in the College of Engineering at Nebraska since 1996 and is a tenured full professor in the Department of Electrical and Computer Engineering. Between August 2008 and August 2010, Pérez was a program director in the Division of Undergraduate Education at the National Science Foundation. In that role, he managed a portfolio of awards totaling more than $30 million and worked on projects involving the National Academy of Engineering and the White House Office of Science and Technology Policy. He received a National Science Foundation CAREER award and has been the principal or co-principal investigator on grant projects totaling more than $15 million. Pérez’s research centers on wireless communications, informational processing and engineering education. He earned a Bachelor of Science degree in electrical engineering from the University of Virginia, and Master of Science and Doctor of Philosophy degree — both focused on electrical engineering — from the University of Notre Dame. A 16-member committee made up of faculty, staff, students and college stakeholders led the search for the College of Engineering’s next dean. The committee was led by Kathy Farrell, dean of the College of Business. Pérez has been named dean at a pivotal moment in the history of Nebraska Engineering. The college, which will celebrate its 110th year in 2019, is undergoing a period of growth, including 11 straight years of record enrollment. In the last three years, 56 new faculty positions have been added with 14 more positions in process. The new dean will have the opportunity to define and implement a strategic vision for the college’s faculty, staff and student population. Pérez will also play a key role in guiding the construction of a new engineering facility and renovation of existing spaces. The engineering dean reports directly to the executive vice chancellor and chief academic officer. Learn more about Nebraska Engineering.